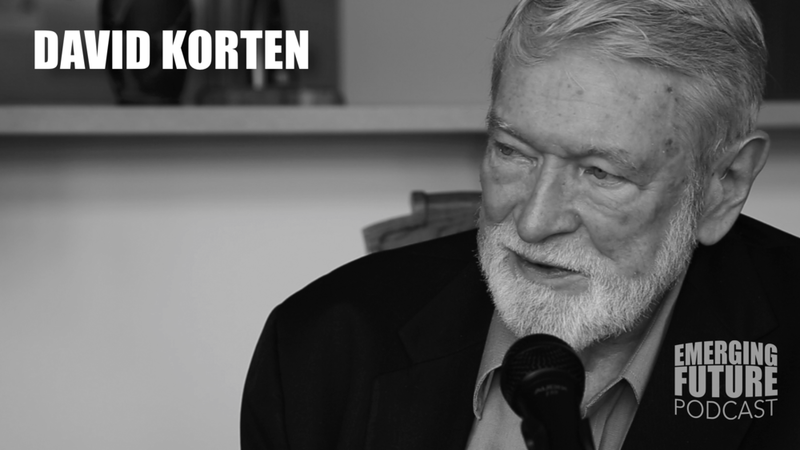 Listen to the Podcast conversation with David Korten and Joel de Jong by clicking the photo or one of the links below. International best-selling author, speaker, and engaged citizen, David Korten, is a living embodiment of curiosity, compassion and courage, whose wisdom comes from many years of exploration and experience. In early adulthood David devoted his career to ending poverty. Later after holding a faculty position at Harvard he made a permanent break with academia which he says was the most intellectually liberating decision of his life. Fast forward a couple decades after being employed by the foreign aid establishment living and working in Africa , Latin America, and Asia, David completely defected from the establishment after recognizing the captivity foreign aid was actually creating. Eventually, David came to see the connection between the social and environmental devastation he was witnessing abroad and the economic policies practiced and advanced by the United States through its foreign policy, use of military power, and corporate reach. Finally embracing an Earth Centered Living Systems Frame David has since devoted his professional life to applying the lessons of life’s self-organizing evolutionary journey to the quest to displace a global corporate-driven money-seeking suicide economy with a life-serving living Earth economy. International best seller, When Corporations Rule the World is David’s seminal work, In this conversation David and I discuss his most recent book, Change the Story, Change the Future: A Living Economy for a Living Earth.